Our professional team is ready to make sure you feel relaxed and ready to start your healing process. We will ask you to fill out some paperwork when you arrive, so please arrive 15 minutes before your initial consultation. You will be brought into a private room to see the doctor. In the next 45-60 minutes, we’ll discuss your health history, health goals and give you a thorough examination. 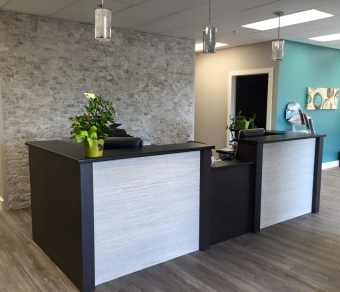 This is followed by giving you a report of our findings from the examination, answering all your questions, and explaining your treatment plan that will lead you to your health goals. The treatment plan can include home care, which can help continue your progress between treatments. A treatment may be given during the first visit, unless X-rays are necessary. If so, we will see you after we’ve gotten your X-rays from your family doctor and discuss a treatment option then. These visits are necessary for the correction of the problems. Since most questions have been answered and the doctor has already planned a treatment for you, these visits are relatively short in duration (5-7 minutes) unless there is a new problem or you have a new question. Periodically, the doctor will verify your progress to date and reassess the adjustment plan as needed. Your chiropractor will spend time each visit talking to you about ways to improve your health and continue feeling great. We usually recommend maintenance care for regular tune-up once you are feeling better. These visits may only be necessary every several weeks. We will treat you according to your body and how you are responding. Your treatment is individualized because we are all different; we all have a different history and lifestyle. Do you have any questions about what we can do for you? Contact our office today and we’d be happy to discuss them with you.